Earlier in the year, I wrote about the arrival in Australia of an extraordinary medieval survivor from Venice: Fra Mauro's Map of the World created around 1450 in Murano and now resident in the Biblioteca Nazionale Marciana. (You can read the original post about Fra Mauro's map by clicking here). 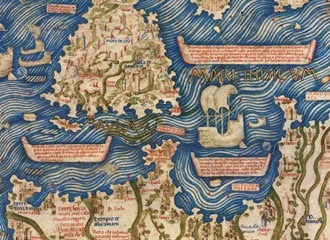 Fra Mauro's map was the headline of the National Library of Australia's extraordinary exhibition, Mapping Our World: Terra Incognita To Australia, which closed earlier this month. My three patient girlfriends agreed to be dragged four hours drive from Sydney to Canberra on the final weekend of the exhibition to see it with me. I sold it to them as a 'girls weekend away with an exhibition thrown in' but I wasn't fooling anyone - they knew that it was all about Fra Mauro's map for me, and I copped much good natured ribbing about dragging them across the country for a cartography exhibition, of all things. We arrived at the National Library of Australia just after lunch-time on a drizzly, grey Canberra afternoon and settled down on the library's huge terrace with views across Lake Burley Griffin for a bite while we waited for our allocated viewing slot to roll around. And as we relaxed over glasses of wine and lunch, even I was beginning to be swayed by the murmurings of 'can't we just order another bottle of wine and some dessert?' around the table. Fortunately, we stuck to our plan and on the dot of 3pm, headed into the exhibition space with our precious reservations, feeling great sympathy for anguished visitors who hadn't made a reservation and were pleading to be given entry. Mapping our World was an extraordinary exhibition - it was one of those precious opportunities to experience an exhibition where exemplary scholarship meets the necessary financial, diplomatic and cultural connections - and the loan of extraordinary objects are secured. It was incredibly moving for me to stand here - right here in Australia - and to contemplate Fra Mauro's extraordinary, ancient map: an experience that was engrossing, contemplative, educational and a visual delight. No photography was permitted inside the exhibition, but in any case, I could not have adequately captured the rich deep blue and gold of the map, the delight of scanning over 3,000 annotations in the Venetian dialect on the map, or the thrill of discovery as one contemplates the map - of finding the Italian boot, of finding China, of finding 'Giava' - the first time that the Indonesian island of Java was captured on a map. How extraordinary for the curator of the exhibition, Nat Williams, to secure this map for the exhibition. How generous of the Biblioteca Nazionale Marciana to loan the work to Australia. And how generous are the many philanthropists who supported the loan and exhibition of this work: Kerry Stokes AC, Noel Dan AM and Adrienne Dan, Nigel Peck AM and Patricia Peck, Douglas and Belinda Snedden and the Embassy of Italy. If you'd like to see more, here is the link to a video from the National Library of Australia's blog showing the transport of the map from Venice to Canberra.